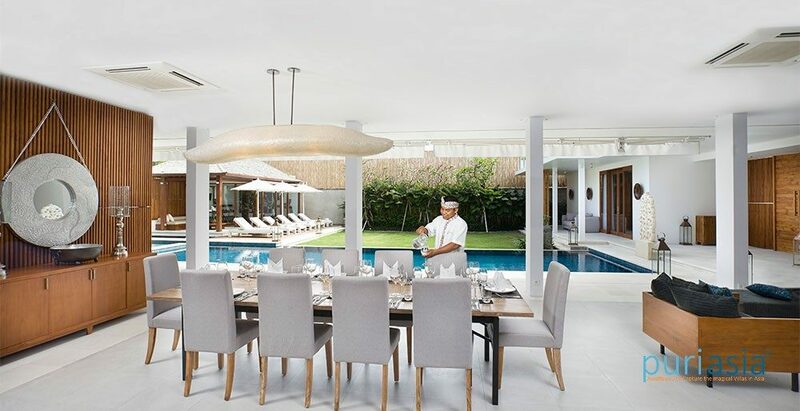 Appropriately named after a bird of paradise, five-bedroomed Villa Cendrawasih presents the modern face of Balinese villas in Seminyak, combining cutting edge design with supreme comfort and the friendliest of staff. Imbued with contemporary sophistication, the villa perfectly reflects it’s setting in Petitenget, a district renowned for hip beach clubs, world-class dining, funky boutiques and cosmopolitan edge. 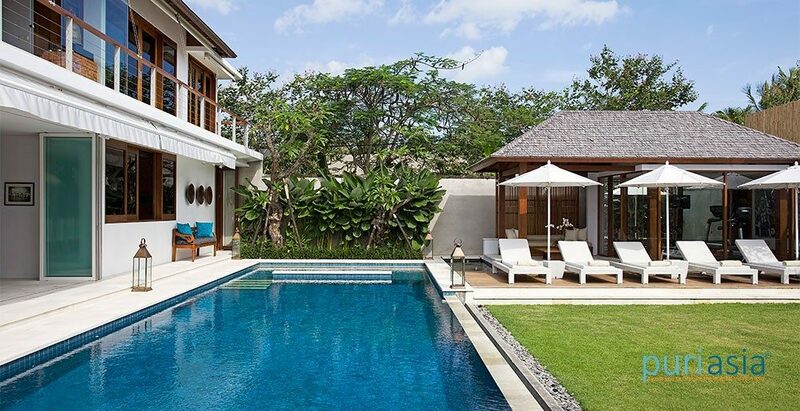 With uber-trendy W Resort right next door, Villa Cendrawasih is in great company. 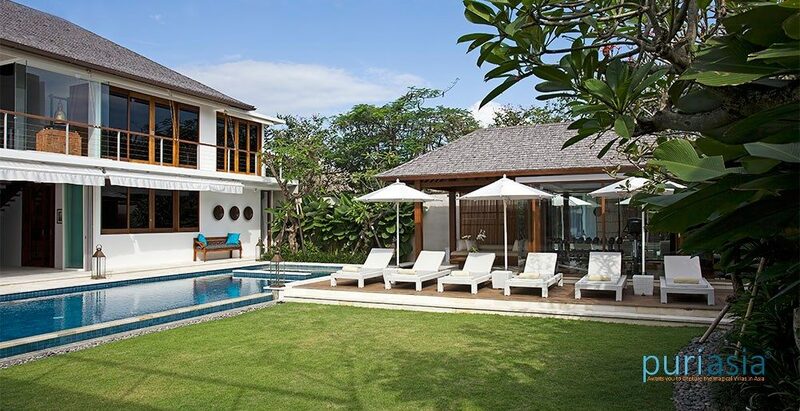 With five bedrooms and a fabulous location within a stone’s throw of a sandy beach and some of Bali’s most famous beach clubs and restaurants, Villa Cendrawasih has it all. 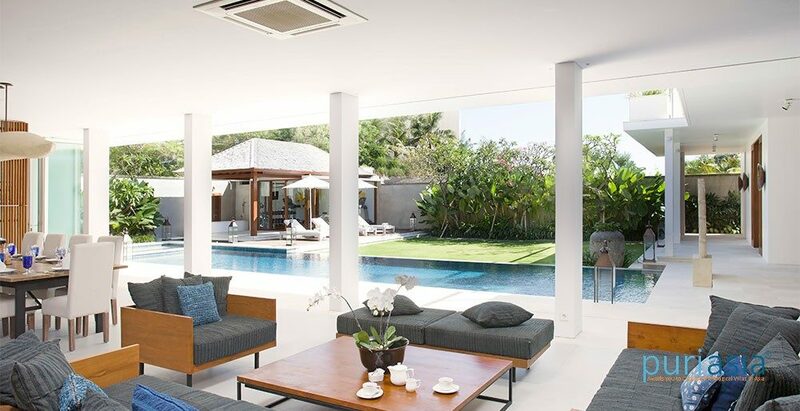 A stylish modern design is complemented by ample creature comforts, including an 18-metre swimming pool, well-equipped gym and charming sun terrace, making it equally suited to quiet family holidays, or groups of friends looking to paint the town red. 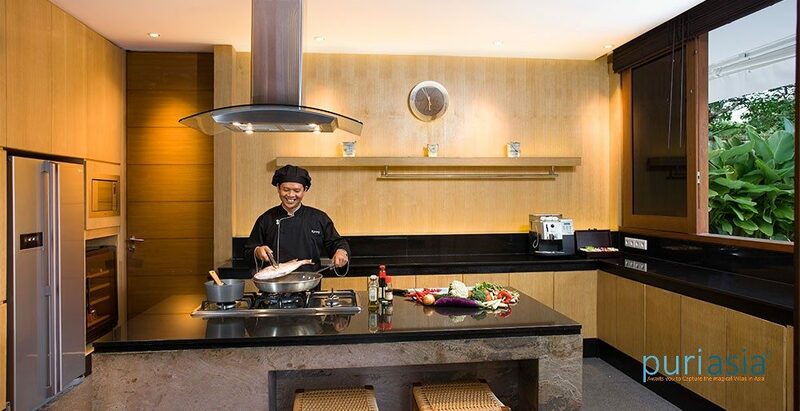 Fabulous staff are a definite highlight and include attentive butlers who will cheerfully cater to every whim and an inspired chef to prepare gourmet meals. Occupying a square parcel of land, L-shaped Villa Cendrawasih wraps around the swimming pool and garden. The main building is spread over two floors, with entrance foyer, kitchen, guest bedroom, lounge/dining area and TV room (which doubles as the fifth bedroom) on the ground floor, and three bedrooms and a roof terrace on the top floor. The gym occupies a separate pavilion in the garden. 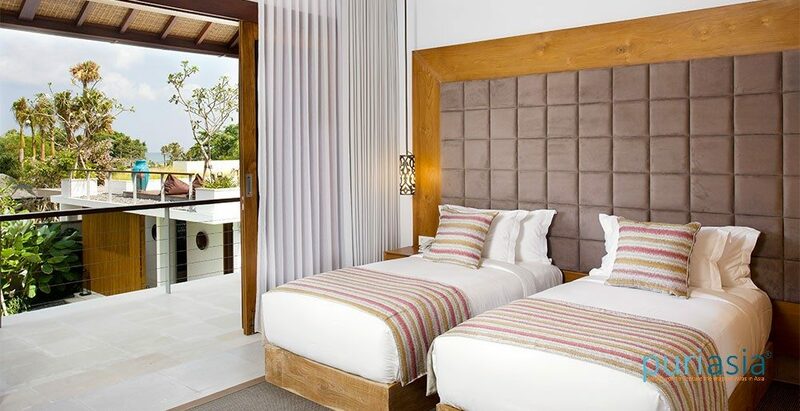 Villa Cendrawasih’s contemporary-styled bedrooms are similarly configured, with air conditioning, elegantly draped tinted-glass doors, and satellite-channel TV/DVD player. Each has a unique colour scheme, eclectic artwork and ethnic curios. 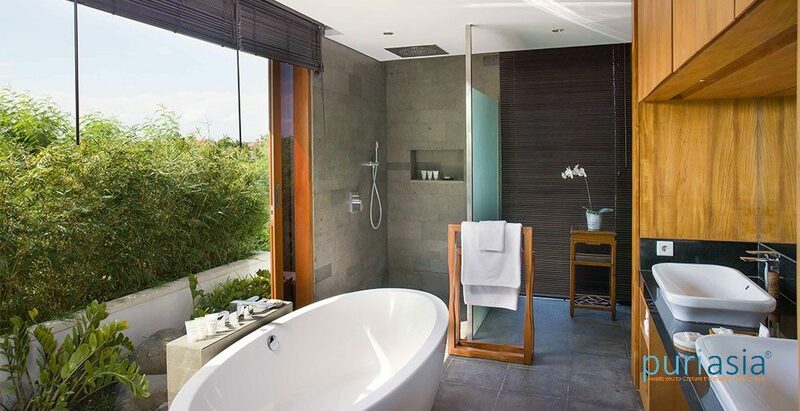 Bathrooms are a mix of natural stone and wood, with sleek chrome fittings and wooden blinds. The TV room on the ground floor easily converts to a fifth ensuite bedroom. Set on the top floor, this large master bedroom has direct access to the roof terrace, with king-size bed, wood desk and plump sofa. 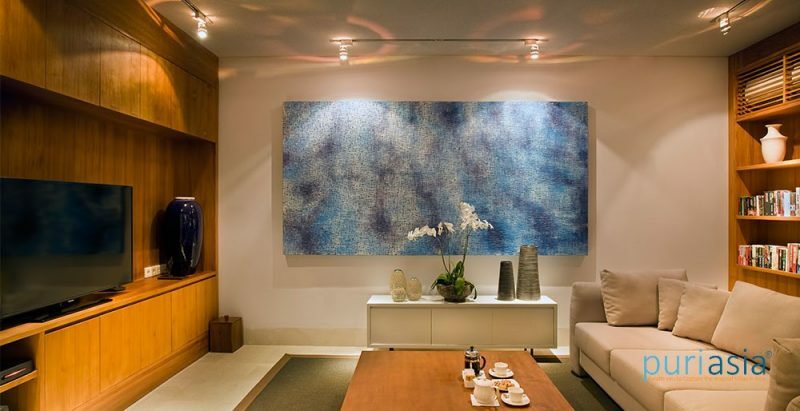 Modern art painted in hues of copper, silver and gold adorns the walls. The walk-through dressing room is flanked by large mirrors and leads to a sleek spacious bathroom of dark grey stone with wood fittings, large walk-in rain shower and a freestanding bathtub. This upstairs bedroom is furnished with a king-size bed convertible to twins, sofa, walk-in wardrobe and desk overlooking the pool. Evocative Balinese ceremonial photos decorate the walls. The brightly lit bathroom has twin basins, a large walk-in rain shower, bathtub, and two baroque-style chairs and table. Opening onto the upstairs deck with views of the pool and garden, this room has a king-size bed convertible to twins and an easy chair for lounging. Portraits of Buddhist monks grace the walls. Wood sliding doors leads to an ensuite bathroom with built-in wardrobe, mirror-topped counter with single large hand basin and a large walk-in rain shower. This spacious guest bedroom is on the ground floor to the side of the entrance foyer. 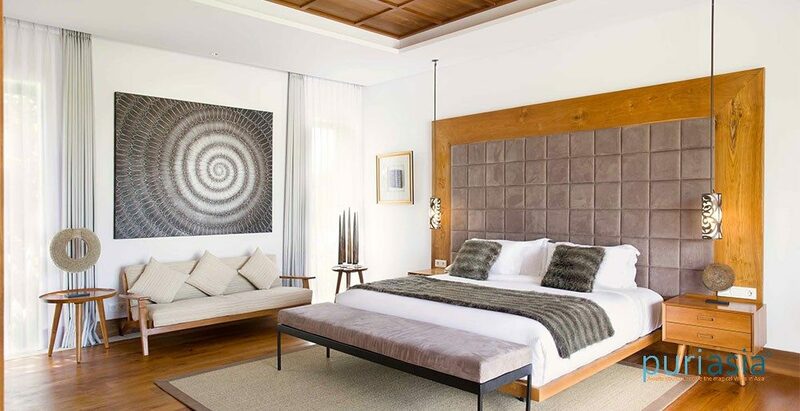 Opening directly onto the garden, the room boasts a private sitting area on its terrace and is furnished with king-size bed and sofa. Traditional wooden Balinese statues serve as decoration. The bathroom has grey stone floors, his and hers vanities, a large walk-in rain shower and freestanding bathtub. 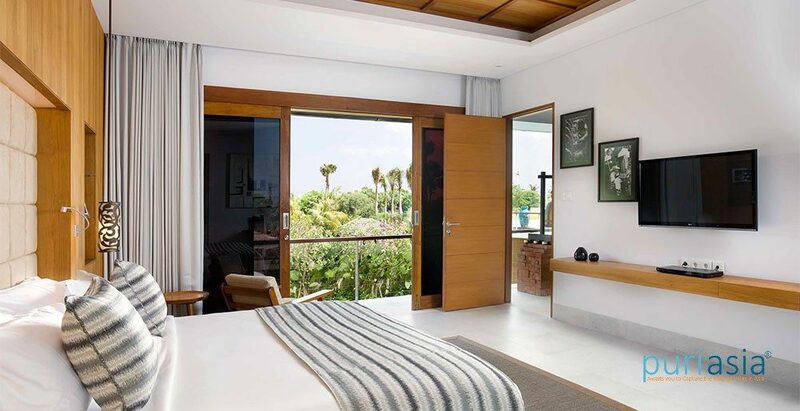 Next to the sitting area, sliding doors open to a TV room which can be easily set up as a fifth bedroom. 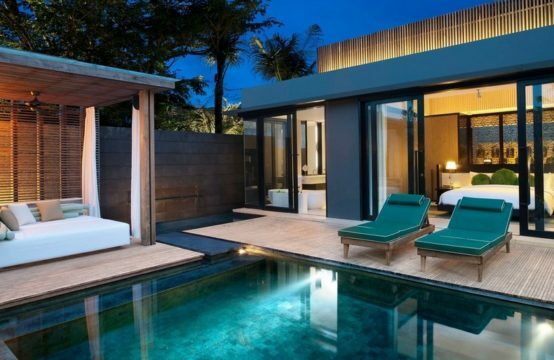 It is furnished with a large, comfortable sofa bed that converts to either a king-size bed or twin beds, and has an adjoining bathroom fitted with a walk-in rain shower. 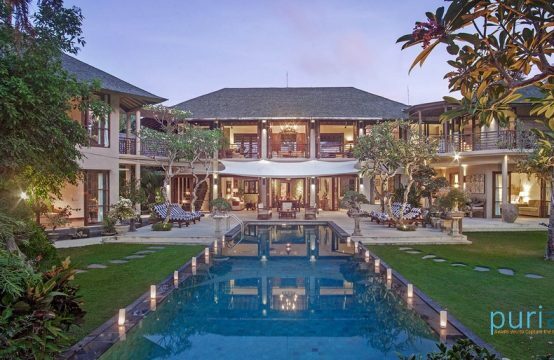 Handsome wooden doors open onto the villa’s bright entrance foyer, overlooking a walled garden edged with a profusion of pink frangipani trees grafted with white orchids. Separating the garden and the living room is an 18-metre pool (including shallow wading pool at one end) and sun deck lined with six loungers shaded by sunbrellas. The air-conditioned living and dining area lies to the left of the foyer. 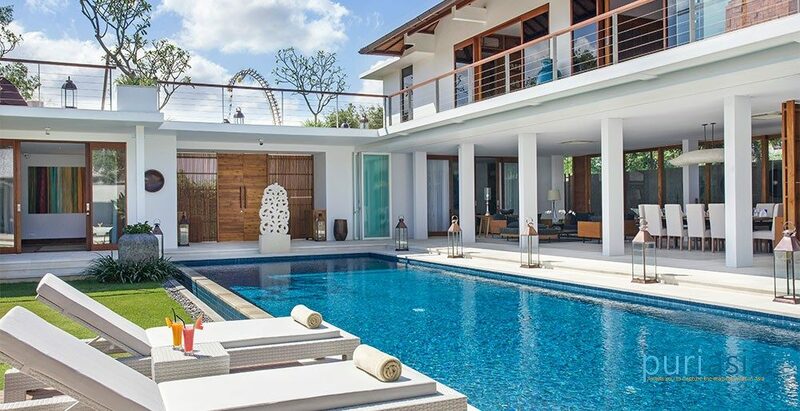 Glass doors can be folded right back for a semi-outdoor living experience and instant access to the pool. A long dining table seats 10, while a sideboard is embellished with elaborate silver candlestick holders and a silver-framed mirror. The contemporary living area is furnished with teak sofas and chairs upholstered in a stylish grey and set around a square coffee table. An iPod, dock and Bose speakers provide entertainment. The attractive wood-panelled kitchen, separated by glass doors from the dining room, is fabulously equipped and includes a wine fridge, coffee machine and mini bar. Villa Cendrawasih’s TV room is equipped with an oversize sofa, 55-inch HD satellite-channel TV, Bose sound system and movie box with 250 movies. Bookshelves are stacked with a good assortment of novels. An adjacent guest bathroom is fitted with built-in wardrobe and a rain shower. This room can be converted to a fifth bedroom with choice of king-size or twin beds. 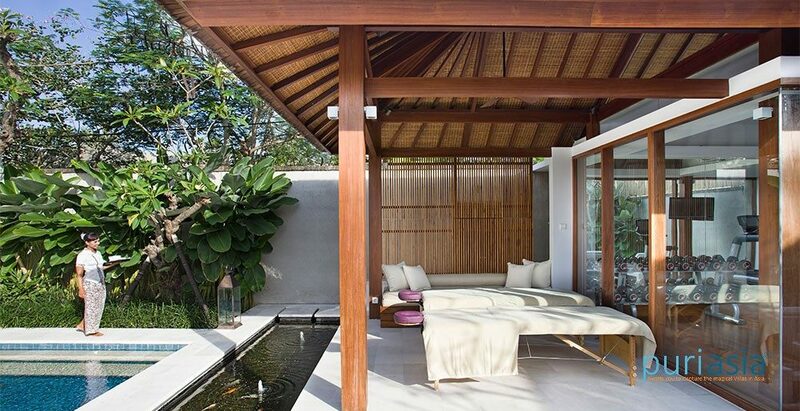 At the top of the stairs is a conveniently situated mini bar and a shady veranda leading to the spacious roof terrace encircled by pebbles, manicured lawn and flower boxes. 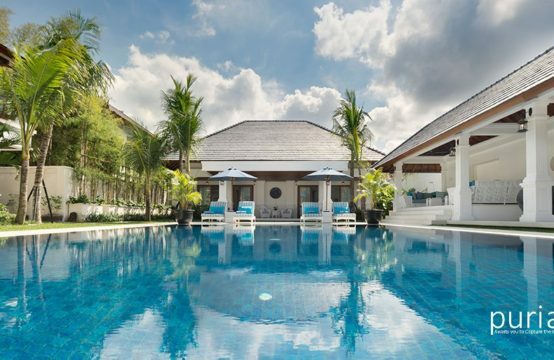 Aqua daybeds and grey bean bags make a comfortable setting to enjoy expansive views that take in coconut palms, volcanoes and the sea sparkling between the trees. The gym occupies its own glassed pavilion in the garden and is fitted with professional Life Fitness equipment, wall mirrors, weights, exercise bike, tread mill, yoga mats, TV and bathroom with shower. 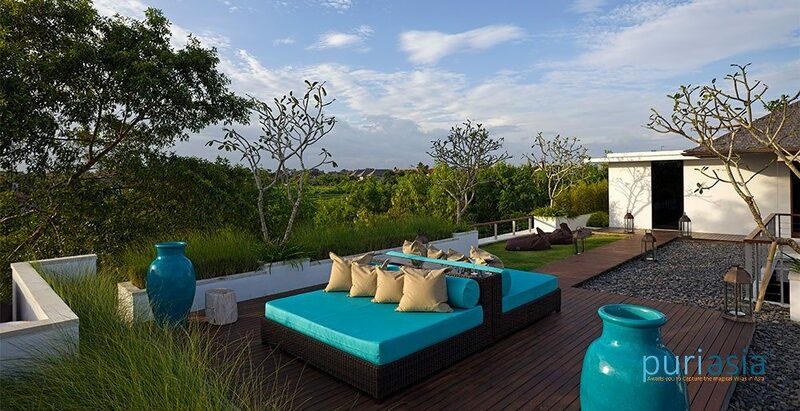 The adjoining terrace is topped with a large cushioned daybed. 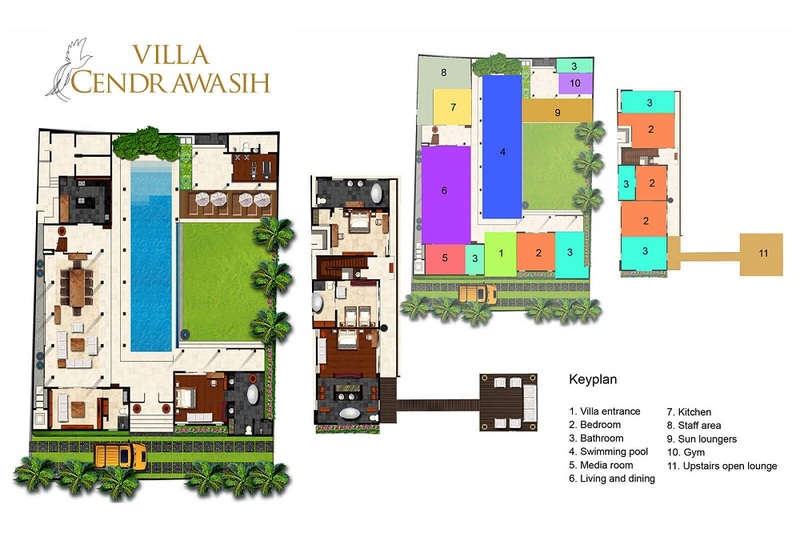 578sqm villa size. 831sqm land size. Capacity for 10 people (4 ensuite bedrooms with king-size or twin beds, plus TV room which converts to fifth king or twin-bedded room). 18 x 5 x 1.5metres swimming pool. 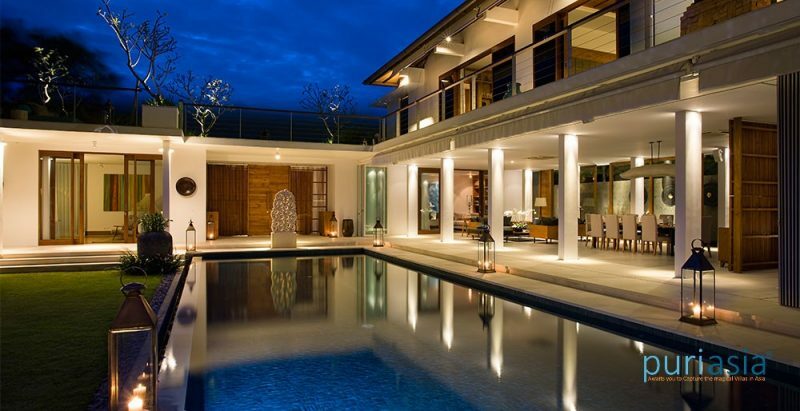 Fully staff, Villa manager; private chef; butlers; night security and driver. Additional staff (babysitters,masseuses) available on request. Suggestion menu includes Western, Asian, vegetarian and children’s dishes. Requests accommodated (including special diets). 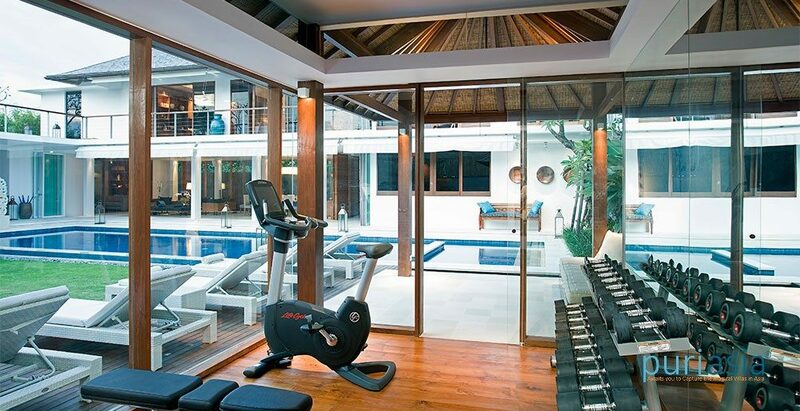 Gym is equipped with weights, treadmill, exercise bike and yoga mats. Well equipped for families. Facilities include: baby cot; high chair; pool safety fence (charge applies); pool with wading area. A seven-seater car and driver is available at a special rate of US$ 25++ for up to eight hours a day excluding petrol.